If you have been given one of my new cards like the picture to the right and are therefore looking for my dedicatedmusic website please click on the picture and it should take you there. 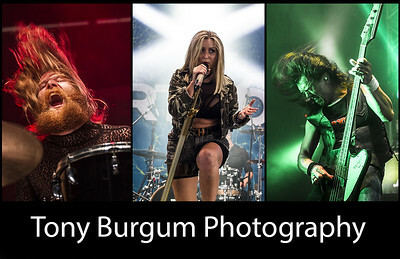 I have created a bespoke site purely for my music photography. This site will only be open for another year as I have decided to cease music photography unless 1) It is a payed for gig or 2) It is a band I want to help. Hence all of my music will be brought back into this site by 2020. Hello my name is Tony Burgum, I am a photographer from the North East of England with around 40 years photographic experience, (born 1963 so you do the math). Welcome to my site, feel free to browse through it, if you like it pass the info on and share with your friends if you don't like it pass your thoughts and comments on to me, I am always available for constructive criticism so please use the Email envelope in the top right corner if you find something wrong or wish to advise me about. I have photographed my local Rugby club for many years now and far too many galleries to host on here so I have trimmed them down quite a bit. Normally these are given away to the kids free all I ask is they put the shots on their Facebook and Twitter pages and give my photography page a 'Like'. I also shoot football and Ice Hockey on a frequent basis and have been published in local papers. Although I have travelled quite a bit I always try to give advice based on my personal experiences and my individual advice. There is a young lady who is a more dedicated traveller than me and offers some very good advice on her travels so visit her page here:- The Culture Map her name is Shing Yoong you can also visit or follow her on Facebook or Twitter here. I am a nature nut and I have a particular fondness for anything small and miniscule especially spiders. Despite the rubbish written in the UK press there are no UK spiders that are that venomous that they will kill you, unless of course you have a reaction in the same way bees or wasps can kill you (anaphylaxis) so if you see a spider, admire it, don't kill it. In case you are wondering, the LRPS initials after my name stand for Licentiateship of the Royal Photographic Society. I attained this level at my 1st attempt back in 2014 and now creating a portfolio for my ARPS (Associate member).